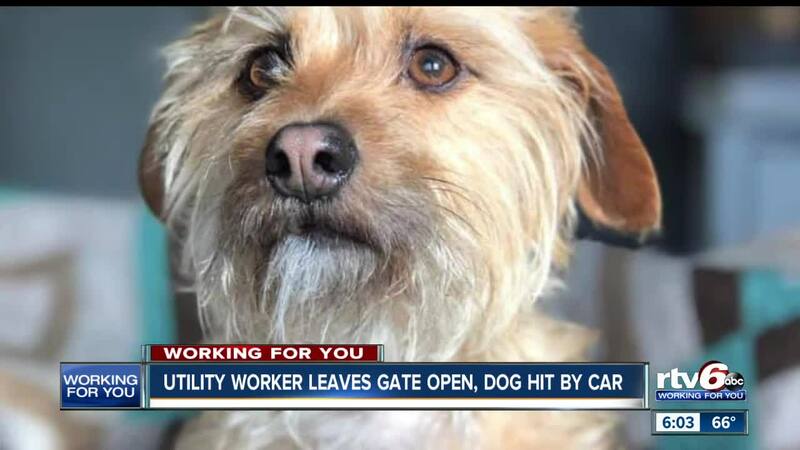 Utility worker leaves gate open, dog hit by car. INDIANAPOLIS — A family is grieving the loss of one of their dogs after a mistake made by a utility worker. The family shared their story as a warning for all pet owners with RTV6. "So when she let the dogs out, she just opened the door really quick. And when you open the door, you can't see the gate back here," Victor Gosnell said. It's a routine that Gosnell and his wife do without thinking. The couple let the dogs outside in their fenced in yard, but on Tuesday afternoon something was different. "Apparently the gate was left open," Gosnell said. "Two of our dogs ran out. She immediately ran after them." Outside the gate, there was a utility worker with the company Samco who admitted he left the gate open. The worker immediately helped Gosnell's wife search for the dogs. "They found one of our dogs, Griffin, just a few houses up - he's a senior dog. They grabbed him but Gilly, our Terrier Dachsund mix, she sprinted," Gosnell said. "They continued to look for her. My wife called me, and I was rushing home." While they were out searching, they received a call from a driver who said they saw Gilly get hit by a car. It happened at the intersection of 43rd Street and Meridian Street. Since Gilly had tags with the couple's contact information, that driver was able to notify them right away. "She had been hit good enough to essentially sever her spine and at least one, if not, multiple places. There was no feeling in any of her extremities. Very little or no response from her eyes. And she was basically done," Gosnell explained. "She was still breathing, they put her on oxygen because she couldn't fully breathe well on her own. So we just spent a little bit of time with her and then say goodbye." A spokesperson with Samco said they are very sorry for the couple's loss. They are now working to make sure it doesn't happen again. Gosnell said Samco did offer to pay for Gilly's final vet bills. "They knew it shouldn't have happened this way and they were very very sympathetic to us about it." Now Gosnell is taking his own steps. He bought locks for his gate and will make sure it's latched every time before letting the dogs outside. Citizens Energy Group confirmed that Samco was doing contract work for their company. RTV6 asked Samco for their policy when entering backyards and they say if there are signs that someone is home, they knock on the door and let the resident know they're entering the yard. If no one is home and a dog is outside, they come back later in the day. If no dogs are present, they are supposed to shut the gate while in the back yard and after completing their work. They also said that if utilities are in the backyard and they have an 811 dig request to locate lines, they have the right to enter at any time.